China expands trade, relations to Africa By Greg Houl Source: Washington Times. June 30, 2009. [caption id="attachment_742" align="alignleft" width="300" caption="China Safari: On the Trail of Beijing ©Washington Times"] [/caption] CHINA SAFARI: ON THE TRAIL OF BEIJING'S EXPANSION IN AFRICA By Serge Michel and Michel Beuret Nation Books, $27.50, 336 pages, illus. REVIEWED BY GREG HOULE It is well known that since China began to embrace capitalism in the late 1970s, its economy has, for the most part, raced forward at breakneck speed. Last year, China's economy ranked second in the world, behind only the United States. In order to keep up the frantic pace of economic growth to which it has become accustomed, the formerly isolationist nation has begun to spread its wings. And largely driven by an intense need for more sources of energy, China has been using some of its vast holdings of foreign currency to invest in new opportunities abroad. Nowhere has this Chinese expansion been felt more strongly than on the continent of Africa. Bilateral trade between the two regions increased from $10 billion in 2000 to $55 billion in 2006, and China recently has become Africa's second-largest trading partner. Over the past four years alone, Chinese government leaders have made seven tours of Africa and visited more than 30 nations on the continent. New direct airline routes have paved the way for thousands of Chinese entrepreneurs and opportunists to flood into Nigeria, Ethiopia, Cameroon and a dozen or more other African nations to seek their fortunes in this brave new capitalistic world thousands of miles from home. So far, the Chinese adventure into Africa has, with the exception of some xenophobic attitudes on both sides, gone off without much of a hitch. The Chinese get to extract what they are seeking so desperately — mainly oil and other natural and mineral resources — and in return, they build roads and dams and provide cheap goods to their African hosts. But what should we make of this neocolonization of the African continent by a single, increasingly powerful communist nation? 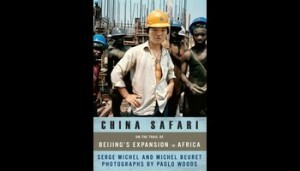 Serge Michel and Michel Beuret, two European journalists who have done extensive reporting from Africa, along with photographer Paolo Woods, try to answer this difficult but important question in "China Safari: On the Trail of Beijing's Expansion in Africa." First published in France last year, the book offers a series of witty vignettes derived from the authors' extensive reportage throughout the African continent and China. They write about the poor, provincial Chinese workers who travel thousands of miles from home to seek their fortunes in a modern-day gold rush. They report on the (mostly) grateful African government officials who eagerly accept Chinese offers of assistance in building infrastructure in return for a piece of their own valuable resources. And they glean some of the global response to China's aggressive actions in Africa, detailing some of the concern and, increasingly, the relief other governments feel toward China's involvement in the continent. In the four or five decades since most African nations gained their independence, hundreds of billions of dollars of direct aid has been injected into these governments, mostly by Western governments. The results have been disastrous. Not only has the continent, on the whole, not improved its lot since colonial independence, it actually has gotten poorer. The Cold War era provided the opportunity for both Western governments and those in the Soviet sphere to indiscriminately fund seedy and unscrupulous African dictators, leaders who sided with their ideology but let their own people starve. But when the Berlin Wall crumbled, so did the need for ideological aid money, and many African dictators were abandoned by the superpower blocs. Soon, a new, more principled approach to giving aid money was developed, but in the post-Sept. 11 world, the drive to support a global war on terrorism has opened the door once again to Western support for less-than-democratic leaders such as Ethiopia's Meles Zenawi. This has helped lead to a noticeable backlash in recent years against traditional aid to African governments. Many economists are openly advocating for less aid to the continent. It is within this backdrop, the authors note, that Chinese involvement has largely been welcomed by African governments — if not by Africans who often lose potential jobs to Chinese workers. Providing aid without regard to political ideology and without preconditions, China has been the African dictator's best friend. The Chinese, for example, have happily bankrolled Sudanese leader Omar Ahmed al-Bashir, the international pariah who is largely blamed for the ongoing conflict in Darfur. A few years ago, while China was just beginning its influx into Africa, concern in the United States was rife. But, as the authors make clear, much of that concern has since melted away into a sense of complacency and even relief over the fact that at least somebody is providing much-needed support for a continent with such great needs. "China Safari" tackles an important and largely underreported topic with an engaging and lively verve, but the book's haphazard organization (the brief chapter about China's history in Africa is particularly disorganized and out of place) hinders its narrative flow and sometimes leaves the reader with more questions than answers. Given the lack of transparency of the Chinese government and the African governments that it supports, legitimate information about Chinese ambitions in Africa is, admittedly, hard to find. Nevertheless, Mr. Michel and Mr. Beuret make an important contribution, without passing judgment, toward our understanding of China's intentions in Africa. Greg Houle is a freelance writer and founder of www.africanupdate.com.